This series, along with spin-off series; Surfside 6, Hawaiian Eye and Bourbon Street Beat; were produced by Warner Brothers, the first major American studio to dive full bore into television series production; and all aired by ABC (the network now owned by The Walt Disney Company; not the old British network). The one major coincidence of these series were the seemingly interchangeable plots, locales (Surfside 6 in Miami Beach; Bourbon Street Beat in New Orleans and Hawaiian Eye in Honolulu) and casts; both in the adventure series noted above; as well as their cadre of Western shows such as Cheyenne, Maverick and Lawman. 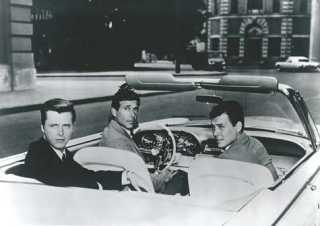 The show starred Efrem Zimbalist, Jr. as Stu Bailey, Roger Smith as Jeff Spencer and Edd Byrnes as Gerald Lloyd Kookson III ('Kookie'). A hip, humourous series with flashy action that ushered in a rash of copycat, new-style private eye shows. Set in Hollywood, they worked out of office no. 77 on Sunset Strip and their cases took them to all the glamour spots of the world. Visit the Mid-Atlantic Nostalgia Convention September 18 - 20, 2008 in Baltimore, Maryland which will be featuring Edd Byrnes as a guest. We will be playing a few TV shows with Byrnes such as playing Kookie on 77 SUNSET STRIP and his cross-over episode in SURFSIDE 6, and his appearances on HONEY WEST and the ALFRED HITCHCOCK HOUR in our movie room. Edd Byrnes will be signing autographs for the fans. The least commercially successful of all the 77 Sunset Strip clones churned out by Warner Brothers back in the sixties, despite the intriguing setting of New Orleans. In the debut, loosley based from Hammett's The Maltese Falcon, Big Easy private eye Cal Calhoun, a lanky, easy-going ex-bayou cop, takes on a junior partner, Rex Randolph a young, yuppie-ish Ivy Leaguer from one of New Orlean's "best" families. Together they run 'Randolph and Calhoun Special Services" next to The Old Absinthe House in the French Quarter. The secretary was Melody Lee Mercer, and the rookie was Texas rich kid Kenny Madison, who was working his way through law school by doing part-time PI work. Another product from the Warner Bros. TV Eye factory, picture this one as "77 Sunset Strip goes Hawaiian." Actually, Hawaiian Eye was the most successful of the Sunset clones, lasting four seasons. Set in Honolulu, it featured the exploits of handsome private eyes Tom Lopaka and Tracy Steele, who worked out of a swank, poolside office at the Hawaiian Village Hotel. Adding comic relief were Cricket, a nightclub singer/photographer, and Kim, a ukulele-playing local cabbie. And, of course, there were crossovers with P.I.s from 77 Sunset Strip, Bourbon Street Beat and Surfside Six. New eye Greg MacKenzie joined the agency in December 1960. All the eyes made good use of their police contact, Quon. Crossover appearances by: Edd Byrnes, Richard Long, Efrem Zimbalist Jr.
Another Warner Brothers detective show, inhabiting the same warped, incestuous TV universe as 77 Sunset Strip, Bourbon Street Beat and Hawaiian Eye. In fact, originally, Kenny Madison was a private eye on Bourbon, but when that show flopped, he was recycled into Surfside. In fact, you just never knew who would drop in from another show. The hook in Surfside Six was that the detectives worked out of a houseboat in Miami Beach. Among the P.I.s dropping in from other shows were Kookie and Jeff Spencer from 77 Sunset Strip appear in "Love Song For A Deadly Redhead" and The Frank Ortega Trio appeared in "A Piece Of Tommy Minor." 77 Sunset Strip, of course, served as the blueprint for Surfside Six.